Wonderful job - Stowarzyszenie Młodzieżowych Inicjatyw Twórczych "CREATOR"
SMIT "CREATOR" members were participating in a YE titled Wonderful job all co-ordinated by Future in the past and held in Belogardchik, Bułgaria. Participants in the project will be 35 young people from 5 European countries. The primary aim of the project is to rise the knowledge of the young people about natural wonders (objects) and how to use efficiently and creatively their potential for creating alternatives for youth employment. Youths will be given the task to design, plan and realize in practice different innovative projects, which are to find place in the exchange itself and as follow up activities as well. We are planning to organize outdoor volunteer activities related to one of the important objects of cultural heritage in benefit of the local community. The working methods we will use are “group work” in small groups, “learning by doing”, “interactive presentations”, “brainstorming”, etc. April 20 – 26, 2013 is one of the best spent weeks in my life! Why…? 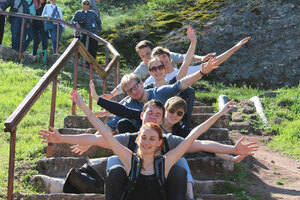 I took part in Youth Exchange “WONDERful job”, which took place in Belogradchik in northern – west part of Bulgaria. The aim of mentioned project was to increase knowledge about natural wonders and use benefits it gives in creating workplaces for youths. During the exchange people from 5 countries: Poland, Bulgaria, Romania, Lithuania and Turkey have met. It was amazing opportunity to learn about different cultures and customs because of pure contact with it. Our project made up a unique space for discussing national stereotypes and prejudices. It gave us also possibilities to fight against it. Moreover, we had an occasion to experience natural advantages of region – amazing Belogradchik Rocks and Magurata Cave. Thanks to this, we could participate more effectively during group work which topic was how to vitalize and develop regional tourism. What is more, I have learnt more about institutions which support national natural heritage as UNESCO and how to plan and apply for such exchanges as “Wonderful job” or projects in UE. Activities which I took part in, has definitely stimulated my creativity and cooperation skills. Wonderful job exchange is one of the best experiences in my life! I have not only learnt a lot but also met awesome people and create international friendships. I cannot wait next project! In April 2013 I participated in a project called „ wonderful job” which took place in Belogradchik (a town in Bulgaria) . For one week we had classes , lectures and meetings with experts about European ideas. Everyday after breakfast participants were spending their time by listening the presentations (about environment and development with union sources) made by bulgarian trainers and learning from them us much as they could. The second part of each day was about working in groups with people from other countries . Our job was to anylyze advantages and disadvantages of problematic issues which organizers wrote on a board before or to try create our own project about the natural and cultural heritage. After discussions and common work in groups every team had to present conclusions and adjustments so other people could agree or disagree with them . Every country had also its own „cultural evening” so we could present typical polish food , music and habits. I'm very thankful i had opportunity to meet people from such countries like Lithuania, Bulgaria, Romania , Turkey , and to share my ideas and expierences with them . I can't wait to repeat this kind of project once again . "Wonderful Job" is the second project I've had the opportunity to attend. The Balice met previously known Polish participants, then took off in the direction of Sofia. Upon arrival I met Nadia and Bobiego (one of the organizers) as it turned out exceptionally friendly and open people. Night in Sofia in Bob's home, his mother is an amazing cook, a table was covered as Christmas Eve. The next day at the station was waiting for a bus to Belgradochik. Finally, we are. Amazing place ... you can easily see that the poor (reportedly the poorest region in the EU) already know where the project. How such a place could have problems with tourism? If Poland had within its borders a rock, most likely would become the largest tourist attraction. Atmosphere at the hotel and other participants caused that right away I felt at home. In my work in the project I have focused above all finding a solution, the problem of poverty in the region. People who had the pleasure to know there will forever be in my heart. A night singing, dancing and playing the guitar I dream every other night. It was a little sad to leave, but with us even for a week Blegrodachik was full of life and energy. Students Exchange programe „WONDERful Job” was held in the charming place close to Belgradchik rocks, 2 hours away from the capital of Bulgaria – Sofia. This destination occure to be the best inspiring place to visit and work. As a group of young and motivating people from various countries – Poland, Lithuania, Romania, Turkey and Bulgaria we create many projects consider about the natural and cultural heritage. During the workhops we had opportunity to share ideas how to improve tourism in our region and also get a knowledge about natural wonders from our countries. Through desinging our environment, we design ourselves. We spent also one day in the magnificent Belogradchik rocks – hiking and admiring the natural beauty of the place. I would love to repeat kind of experience once again! The WONDERful job Project was a successful and pleasant one. It took place near a city of Belogradchik, close to a beautifil and breathtaking rocks, which are distinctive for this region. Organizers tried to show us beauty but also hard situation of this region of Bulgaria, so much different than well known parts of it - like Golden Sands or Sunny Beach. This Project also gave us a chance of direct contact with people from different countries and – what’s following - learn about their culture. It was not only thanks to daily relations between participants, but also the cultural nights, when every group had to show others specifics and diversity of the countries, they were comming from. During the Project we learned opennes, respect and a critical point of view when it comes to local and global problems. We were realizing tasks, which main goal was to give us awareness of possibilities which are given by diversity and greatness of the world. For me it was a great adventure and a very important lesson, and it surely is worth of reccomendation! In the end of April, thanks to SMIT Creator organization, I had a pleasure to participate in youth exchange, which was located in unearthly beautiful place - Belogradchik in Bulgaria. For me, it was a chance to meet people from different european countries, to develop my language skills and to discover such an amazing location. It was my second YiA project, and I am convinced that taking part in events like that gives you an oportunity to develop yourself, to travel and to spend a great time in amazing places. During the project I had a chance to take part in differnt kinds of very interesting activities. Every evening was a cultural party organized by one of the national groups. It was a chance for us to get to know each other and our cultures. Owing to that fact, I've met a lot of wondrous and valuable people. Another project, which made that even for a moment I broke away from reality. Youth Exchange "Wonderful Job" was held in an unusual and mysterious place, near Belgradchik Rocks in Bulgaria. During the visit we discussed on the importance of natural wonders that should be popularize and people should take care for them. While staying we visited many places connected with the main theme of the exchange. An interesting issue of classes and different ways of working with the group made there was no time for boredom. Most of the commitment and dedication required to create a film and shoot on chosen Bulgarian legend. Warm and friendly atmosphere accompanied us from the first day. Hot and warm hospitality of the organizers and a huge concern during the entire stay, it was a unique gesture - for which I am extremely grateful. I met many wonderful people, from whom every day I caught optimism. It is difficult to describe in words how many extraordinary moments experienced during the project. I hope that I will have the opportunity to participate in this unique project!